“Dangerous Crossing” is not so much a noir as a Hitchcockian psychological mystery. A newlywed is suspected of going crazy when her husband mysteriously disappears without a trace. Part of Fox’s Noir Collection, “Dangerous Crossing” is one of the lesser known classics of the genre – a thoroughly entertaining slice of pulp fiction. A newly married couple John and Ruth take an ocean liner cruise for their honeymoon. When they arrive in their cabin, John asks Ruth go ahead and meet up in 15mins at the bar before dinner while he runs an errand. Ruth obliges, but at the bar John is a no-show. In fact, he's disappeared from the entire ship. The ship’s crew search the boat, but to no avail. When asked for identification, ticket, or evidence of John, Ruth can’t produce anything. Suddenly everyone’s suspicious eyes turn on Ruth. Did John really exist, or was he a figment of her imagination? When she reveals the painful period in doctor’s care after the death of her father, the evidence weighs toward psychosis. But when Ruth starts getting mysterious phone calls from John from aboard the boat warning her about their safety, something more devious and sinister rears it’s ugly head. 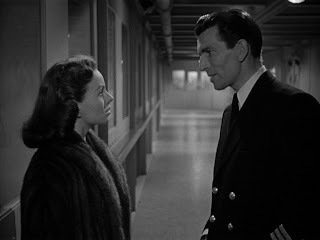 Ruth (well played by Jeanne Crain) goes through an agonizing journey of torturous frustration. It’s a difficult performance, one which could easily have spilled over into emotional overdramatics, but Crain puts the reality of the situation in all her reactions. "Dangerous Crossing” is a technically-perfect genre film. Director Joseph Newman has a great studio shooting style - a Michael Curtiz-influenced look with sweeping crane shots, and elaborate dolly moves to accentuate and heighten the drama. Newman sets the tone of mystery and suspense brilliantly. The location and design of the ship provide the confining clausterphobia within which Ruth’s paranoia can bubble over. The scenes in fog-shrouded night along with the monotonous fog horn lay on the noir-intrigue extra thick. The best scene in the film is a sequence worthy of Brian De Palma's theft. Ruth hears a knock on her door, but when she answers it, no one is there. She looks out into the hall – no one in sight. Just then a door from down the hall slowly opens by itself. Then slowly closes. And of course, Jeanne Craine frightening reaction sells the drama. “Flight Plan” and “Bunny Lake is Missing” tell the same story, an unexplainable disappearance with no evidence to prove the missing person ever existed. Both films are flawed and could not wrap up satisfactorily the ‘is she crazy or not’ conundrum. “Dangerous Crossing” provides the most satisfying resolution of all three films. With the film clocking in at 76mins, there’s not much room for extraneous plotting or lengthy explanations, and so the climax and resolution comes rather suddenly. But the brevity serves the material best. One of the remarkable aspects about the production was the studio's use of economies of scale. “Dangerous Crossing” doesn't look like it was shot for $500,000 in 19 days, but it was. 20th Century Fox creatively recycled sets, costumes and actors from much bigger pictures also in production – “Titanic” and “Gentlemen Prefer Blondes” - to bump up the production value. Combine this with best aspects of the genre - fog, shadows, sound, shady characters and a slowly revealing potboiling plot – and you have a top notch film noir. Enjoy. "Dangerous Crossing" is part of the Fox Film Noir Collection, which also includes "Black Widow" and "Daisy Kenyon". Look for reviews of these films in the coming weeks.